The Heritage Conservation Society-Youth explores the old business district of Escolta with the opening of the Escolta Saturday Market on March 9, 2013 (Saturday). 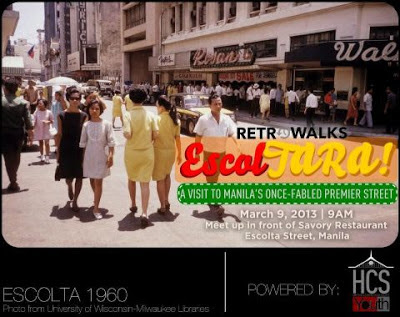 For the guided tour, meet-up is at 9am at Savory Restaurant in Escolta, Manila. You may text Pia thru +63.906.5469933 on the day itself for easy coordination.